At the age of twelve, he took sannyās (renounced order of life) from Śree Achyutaprekṣa without the knowledge of his parents. His sannyās name was Śree Pūrṇaprajña Tīrtha. After coronation ceremony, he was known as Ānanda Tīrtha and after he exhibited the pastime of an āchārya he was known as Śree Madhvāchārya. Śree Madhvāchārya’s place of birth is Pājakākṣetra in the village Uḍipi, which is towards North of one of the major cities in South Karnataka, Mangalore. Karnataka district is on the western side of Sahyādri (mountain) in South India. — Śrīla Prabhupād. Uḍipi city is located about 36 miles towards North of Mangalore of South Karnataka district and about 3 miles away from the banks of the Arabian Ocean towards East. About 8 miles towards South-East corner of Uḍipi, a mountain named Vimānagiri is situated on the banks of the river Pāpanāśinī. The birth place of Śree Madhvāchārya, Pājakākṣetra, is situated about 1 mile on the eastern direction of this Vimānagiri mountain. The river Pāpanāśinī – is combined with river Udiyavara— The History and Significance of Gauḍīya Darśan. Uḍipi, which is situated on the banks of the river Pāpanāśinī, is about 37 miles away from Mangalore of Trivankore kingdom in South India. — Gauḍīya Vaiṣṇava Abhidhāna. He is the son of Śree Madhijī Bhaṭṭa who belonged to Tuluva in South India. — Viśwakoṣa. His birth place is Tuluva in South India. — New Bengali Dictionary by Āśutoṣdev. 1040 Śakābda and as per others 1160 Śakābda — Śrīla Prabhupād. 1160 Śakābda (1238 A. D.) — Gauḍīya Darśan. Śree Madhvāchārya appeared on the tithi of Śree Rāmachandra’s Vijaya-utsav (the day of victory over demon Rāvaṇ) in Śivāllī Brāhmin family to his father Śree Madhvageha Bhaṭṭa and mother Śree Vedavidyā. His father named him Śree Vāsudeva — Śrīla Prabhupād. Father’s name Śree Madhvageha Nārāyaṇa Bhaṭṭa and mother Śree Vedavatī — Gauḍīya Vaiṣṇava Darśan. Father’s name Śree Madhijī Bhaṭṭa. His father named him Śree Vāsudevāchārya. — Viśwakoṣa. Father’s name Śree Madhijī Bhaṭṭa. — New Bengali Dictionary by Āśutoṣdev. Regarding the most prevalent praṇām mantra in the lineage of Śrīman Madhvāchārya, Most Revered Śrīmad Bhakti Promode Pūri Goswāmi Maharāj, who was the chief editor of the monthly magazine Śree Chaitanya Vāṇī had written the following — ‘Śrīmad-hanumad-bhīma-madhvāntargata-rāma-kṛṣṇa-vedavyāsātmak-lakṣmī-hayagrīvāya-namaḥ’. Śree Madhvāchārya is an incarnation of Śree Hanumān of Treta-yuga and Śree Bhīma of Dvāpara-yuga. The viśaya-vigrahas, Śree Rāma and Śree Kṛṣṇa, are included in the āśraya-vigrahas, Śree Hanumān and Śree Bhīma, respectively. Lord Vyāsadeva (an incarnation of Supreme Lord) is the viśaya-vigraha of Śree Madhva. Hence the offerings are made to Śree Lakṣmi Hayagrīva, Who is the Protector of the Vedās and is non-different from Śree Rāma, Śree Kṛṣṇa and Śree Vedavyāsa. Śrīla Bhakti Siddhānta Saraswati Goswāmī Ṭhākur had narrated the following divine instances that occurred during the childhood and adolescence of Śree Madhvāchārya. Śree Madhvāchārya was known as Vāsudeva in his childhood. Many supernatural incidents took place during his childhood. One time, as a young child, he returned alone from Uḍipi to Pājakākṣetra. In another instance when his mother was not present at home he ate a large tank of husk, which is a feed for the cattle, in front of his elder sister in a pretence to stop his cry. One time he was found swinging at the back of a wild bull, tying himself with the bull’s tail. In yet another incident, when a money lender was obstinate of an immediate payment from his father, he transformed a tamarind seed in to a coin and cleared his father’s debt. In his adolescence, he went missing during a festival in the village Mediyuḍu and was later found in the Ananteśwar temple in Uḍipi. He also baffled a brāhmin named Śiva in the village Niyampalli. Śree Vāsudeva underwent thread ceremony (upanayan saṁskār) at the age of five. One demon named Maṇimān (mentioned in Mahābhārat) was residing as a snake at the place of the ceremony. With the thumb of his foot Vāsudeva killed that snake soon after his thread ceremony. Seeing his perturbed mother he jumped over and came in front of her. In such a young age, he exhibited a great competency in learning and education. He had accepted sannyās from Śree Achyutaprekṣa at the age of twelve, in spite of his father’s total disagreement, and became known as Śree Pūrṇaprajña Tīrtha. After touring various places in South India, he had a debate with Śree Vidyāśankar, the then in-charge of Śringi Math. Śree Vidyāśankar’s exalted position was humbled by Śree Madhva. At the age of twelve, he took sannyās (renounced order of life) from Śree Achyutaprekṣa without the knowledge of his parents. His sannyās name was Śree Pūrṇaprajña Tīrtha. After coronation ceremony, he was known as Ānanda Tīrtha and after he exhibited the pastime of an āchārya he was known as Śree Madhvāchārya. — The History and Significance of Gauḍīya Darśan. Śrīmad Brahma-sūtra bhāṣyam or Sūtra bhāṣyam: A very vast commentary in which other philosophical opinions are not refuted but through the evidence of śruti and smṛti, the siddhānta (scriptural conclusions) and saṁgati (reconciliation) are shown. Anuvyākhyānam or Anubhāṣyam: A compilation in the form of verses refuting other philosophical conclusions and establishing his own. Anubhāṣyam: A brief commentary on each adhikaraṇ (sub-sections or topics) of vedānta is presented in the form of verses. In the 9th chapter of Maddhya Lila of Śree Chaitanya Charitāmṛta, Śrīla Bhakti Siddhānta Saraswati Goswāmī Ṭhākur has written in his anubhāṣya (purport), “Śree Madhva went to Badarika along with a sannyasi named Śree Satyatīrtha, where he took the approval of Śree Vyāsadeva after the latter listened the commentary on Gīta (Gīta bhāṣya) from him. 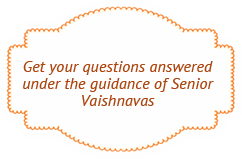 In a very short period, he learnt about various topics from Śree Vyāsadeva. While returning from Badarikāśram to Ānanda Maṭh, he had completed the sūtra-bhāṣya and Satyatīrtha had written it. From Badarikāśrama, Madhvāchārya went to Godāvari in Ganjām district where he met the two scholars – Śree Śobhan Bhaṭṭa and Śree Swāmī Śāstry. Later they became Śree Padmanābha Tīrtha and Śree Narahari Tīrtha respectively in the Madhva lineage. “After reaching Uḍipi, one day while on his way to the sea to take bath, he had compiled five chapters of stotra (prayers to the Lord). While he was deeply immersed in the remembrance of Śree Kṛṣṇa sitting on the sand, he saw a ship loaded with saleable paraphernalia meant for Dvāraka sinking in the sea water. As soon as he made some mudrās (signs or gestures) in order to make the boat float, that boat reached the shore safely. When the passengers of the boat requested him to accept something in return, he had only agreed to accept some gopīchandan lying on the boat. He took a huge portion of gopīchandan and on his way (back), the piece broke at a place called Baḍabandeśwar and a beautiful Deity of Bāla Kṛṣṇa (little Kṛṣṇa) was found inside. In one hand, Bāla Kṛṣṇa is holding the curd churning rod and in the other the rope used for churning. As soon as he obtained Kṛṣṇa he completed the remaining seven chapters of the Dvādaśa Stotra (prayers to the Lord). It can be known from the description of Encyclopedia — In ‘Madhva Vijay’ it is written that Śree Madhvāchārya had compiled Gīta bhāṣya and gifted that book to Śree Vedavyāsa in Śree Badarikāśram. The pleased Vyāsadeva gave him three śālagrāma śilas. Madhvāchārya later installed Them in the Subrahmanya, Uḍipi and Madhyatal Maṭhs. Apart from the śālagrāma, he also installed a Deity of Śree Kṛṣṇa in Uḍipi. There is a narration with respect to the establishment of Śree Kṛṣṇa Deity in Uḍipi — A merchant’s boat sank in the sea all of a sudden at Tuluva while on the way to Malabār from Dvāraka. In that boat there was a Deity of Śree Kṛṣṇa covered by the gopīchandan. When Śree Madhvāchārya came to know this by his divine vision, he lifted the Deity and installed in Uḍipi. Since then Uḍipi became the main pilgrim place for the followers of Śree Madvāchārya. He stayed in Uḍipi for some time and compiled 37 main literatures and many commentaries (bhāṣyās). Śree Madhvāchārya had refuted the Māyāvāda school of thought and established tattva-vād, hence his lineage became very renowned. Śree Madhvāchārya is the third incarnation of wind god (Vāyu) after Śree Hanumān and Śree Bhīma. For this reason, Śree Madhvāchārya was a very mighty person with inconceivable power. In a book describing his holy life, many incidents that prove his super-mundane power are described. Several such instances are already presented before. One more such transcendental incident that was heard from most revered Vaiṣṇava’s is as below. Once Śree Madhvāchārya told his father Madhyageha Śree Nārāyaṇ Bhaṭṭa that he would refute the Māyāvāda philosophy of Śree Śankarāchārya. Listening to his insolent statement, his dissatisfied father told him, “Śree Śankarāchārya’s philosophy is widely spread and respected in entire India. I do not think that there is any capable person who could refute his philosophy. I consider your achieving this task as impossible as the staff in my hand becoming a tree and bearing fruits.” After listening to his father’s words Śree Madhvāchārya addressed him, “My dear father! If I transform your staff into a tree and make it bear fruits, then will you believe?” Saying thus, the powerful Madhvāchārya took the stick from his father’s hands, threw it on the ground with great force and said, “O stick! If I can refute Māyāvāda philosophy then immediately transform into a tree and give fruits.” Immediately the stick became a tree and gave very sweet fruits. Śree Madhvāchārya gave the fruits to his father and others. Seeing such uncommon incident, his father could understand that he is not an ordinary child, that he would become a greatly elevated soul gifted with transcendental power and believed that through him the Māyāvāda philosophy would be refuted. And truly, Madhvāchārya had written ‘Māyāvāda-śata-dūṣaṇi’ in which he had shown hundred defects in the Māyāvāda philosophy. Śree Madhvāchārya, like Śree Hanumān, could become heavier and lighter at will. One time a mighty person named Karanjay, who had strength equal to that of thirty persons put together, could not lift the thumb of his feet that was pressed firmly to the ground. In another instance, he assumed a light body and sat on the shoulders of a child and the child did not feel his weight. Also, in his childhood he had transformed the seed of a tamarind in to a coin and cleared the debt of his father. Most Revered Śrīla Bhakti Promode Pūri Goswāmī Maharāj mentioned the reason for Śrīla Madhvāchārya’s father’s name becoming Madhvageha Nārāyaṇ Bhaṭṭa, “Out of the 120 brāhmanas brought by the king Rāmabhoja the one who constructed a house in the centre of the village in Pājakākṣetra and resided there was known as ‘Madhyageha’. Madhyegeha Nārāyaṇa Bhaṭṭa came to know through celestial words that his son is asudeva (an incarnation of the wind god) and that he is a great devotee of Vāsudeva. Hence he named his son ‘Vāsudeva’. Śree Madhvāchārya had compiled 38 main scriptures apart from many bhāṣyas (commentaries). The main scriptures compiled by him — (1) Gīta bhāṣya (2) Brahmasūtra bhāṣya (3) Anu-bhāṣya (4) Anu-vyākhyān (5) Pramāṇa-lakṣaṇ (6) Kathā-lakṣaṇ (7) Upādhi-khaṇḍan (8) Māyāvāda-khaṇḍan (9) Prapañcha-mithyātvānumān-khaṇḍan (10) Tattva-saṁkhyān (11) Tattva-vivek (12) Tattvodyot (13) Karma-nirṇay (14) Śrīmad Viṣṇu tattva vinirṇay (15) Ṛg-bhāṣya (16) Aitreya-bhāṣya (17) Bṛhadāraṇyaka-bhāṣya (18) Chāndogya-bhāṣya (19) Taittirīya-upaniṣad-bhāṣya (20) Īśāvāsya-upaniṣad-bhāṣya (21) Kaṭhak-upaniṣad-bhāṣya (22) Atharvana-upanisad-bhasya (23) Mandukya-upanisad-bhasya (24) Ṣaṭ-praśnopaniṣad-bhāṣya (25) Talavakār-upaniṣad-bhāṣya (26) Śrīmad Bhagavad Gīta tātparya nirṇay (27) Śrīman-nyāya vivaraṇ (28) Narasiṁha nakha stotra (29) Yamak bhārat (30) Dvādaśa stotra (31) Śrī Kṛṣṇāmṛta mahārṇav (32) Tantra sāra saṁgraha (33) Sadāchara-smṛti (34) Śrīmad Bhāgavat-tātparya (35) Śrīman Mahābhārata tātparya nirṇay (36) Yati praṇava kalpa (37) Jayantī-nirṇay (38) Śrī Kṛṣṇa stuti. The āchāryas of Śree Madhva-tattva-vāda sampradāya term their main math in Uḍipi as Uttarāḍhī Maṭh. The names of the eight maṭhs and their respective in-charges in Uḍipi are — (1) Śodamaṭh – Viṣṇu Tīrtha (2) Kṛṣṇapur Maṭh – Janārdan Tīrtha (3) Kanur Maṭh – Vāman Tīrtha (4) Adamar Maṭh – Narasiṁha Tīrtha (5) Puttugī Maṭh – Upendra Tīrtha (6) Śirur Maṭh – Rāma Tīrtha (7) Palimar Maṭh – Hṛṣīkeśa Tīrtha (8) Pejawar Maṭh – Akṣobhya Tīrtha. The guru parampara of Śree Madhva lineage is — (1) Haṁsa Paramātmā (2) Chaturmukha Brahmā (3) Chatuḥsan (4) Durvāsā (5) Jñānanidhi (6) Garuḍavāhan (7) Kaivalya Tīrtha (8) Jñāneśa Tīrtha (9) Para Tīrtha (10) Satyapragña Tīrtha (11) Prāgña Tīrtha (12) Achyuta Prekṣāchārya Tīrtha (13) Śree Madhvāchārya – 1040 Śakābda. I bow down to that Ānandatīrtha named Śree Madhva muni with great respect. May he be victorious. The learned glorify him to be like a boat to cross over the ocean of material existence. That yatirāj (chief among those in the order of renunciation) is an abode of bliss. “All the Gauḍīya Vaiṣṇavas of Bengal who are followers of Śrīman Mahāprabhu are also followers of Śree Madhvāchārya or Madhvamuni. Śree Chaitanya Mahāprabhu is the eighteenth and Śree Advaita Prabhu and Śree Nityānanda Prabhu are the seventeenth in the preceptorial channel after Śree Ānandatīrtha or Śree Pūrṇaprajña. The three Prabhus have accepted Śree Madhvamuni among their preceptorial channel. Śree Madhvamuni was born in the west Kerala (present Karnataka). He had reformed the pancha-upāsana (worship of five gods – Sūrya, Gaṇeṣ, Durga, Śiva, Viṣṇu) in India and propagated the worship of Śree Viṣṇu as the only duty of everyone. 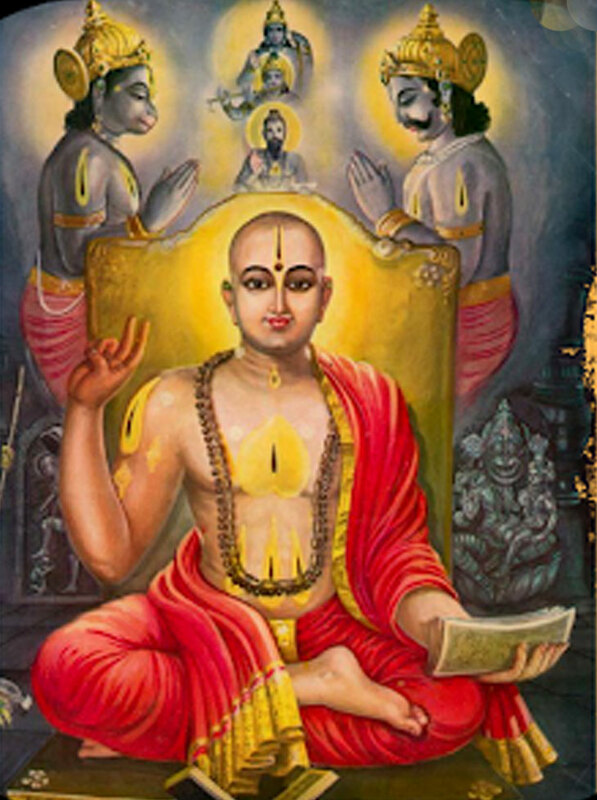 Before his appearance, Śree Śankarāchārya, the āchārya of Māyāvāda philosophy and the son of Śree Śivaguru, had established the ārya (vedic) dharma with effort. Later Śree Madhvamuni had re-established the fidelity and service to Lord Viṣṇu among ārya dharma. Just by the gesture with his fingers, Śree Madhvamuni had shown to the living entities that the basis of theism is eternal servitorship to Supreme Lord. There is no separate resort for living entities other than the devotion to Supreme Lord. The followers of Śree Madhvāchārya consider other demigods to be devotees of Śree Viṣṇu. They worship Viṣṇu as Supreme and with the Prasād of Viṣṇu the other demigods are worshipped. In the northern part of Uḍipi, a Viṣṇu-śila kept in the upper portion of Lord Śiva is worshipped. There is also a deity of Lord Śiva under the hand of Śree Ananta Padmanābha. Though the worship of demigods and forefathers is not completely rejected in the lineage of Śree Madhva, they are not in favour of propagating material reconciliation in the name of pancha-upasana .” — Śrīla Prabhupāda’s Vaktṛtāvali, Part 1. Sriman Madhvacarya manifested his disappearance pastime at the age of 79 years on maghi sukla navami while describing the purports of Aitareya-upanisad to his disciples. As per Śree Madhvāchārya — Śree Hari or Śree Viṣṇu is the only ultimate reality; this world is real; the difference between Lord, living entities and matter is eternal; living entities are servants of Śree Hari; the higher and lower class in the living entities exist eternally as per the difference in their competency; mokśa or salvation is the realization of one’s true nature and it is the permanent state of happiness; pure devotion is the only way to attain salvation; pratyakṣa (perception from senses), anumāna (inference from observation) and śabda (knowledge through revealed scriptures) are the three main proofs for acceptance; Śree Hari is the only truth to be known in all the Vedas and other sacred literature. Dr. Nāgarāja Sharma, in his treatise on “The philosophy of Madhva Dvaita Vedānta”, indicated that the above śloka (verse) is written by Śree Vyāsarāj, the compiler of Nyāyāmṛta. Śree Madhvāchārya said — Śree Viṣṇu is the ultimate truth; He is known through all the Vedas and revealed scriptures; world is real; living entities are separate from Viṣṇu; they are servants of Lord Hari’s lotus feet; there is distinction among living beings; salvation is attaining the lotus feet of Śree Viṣṇu; pure devotion to Śree Viṣṇu is the only way to attain salvation; pratyakṣa, anumāna and śabda are the three proofs of acceptance. Lord Śree Kṛṣṇa Chaitanya-chandra, Who is non-different from Lord Śree Hari, gave same teachings. In his amṛta-pravāha-bhāṣya (purport) Śrīla Bhaktivinode Ṭhākur had written — “By the dedication of the results of fruitive actions (karma), one’s consciousness is purified. With the purified consciousness by the strength of sādhu sanga (saintly association) one attains firm faith in one-pointed devotion to Śree Kṛṣṇa. After the manifestation of firm faith sādhan bhakti (devotional practice) in the form of śravaṇ, kīrtan, etc. begins, after this prema (loving devotion) will manifest to the extent the anarthās (unwanted things) are destroyed. The purport is that by following karma and dedication of the fruits of the karma there is no confirmation that Krsnabhakti shall get manifested for sure, because it is dependent on manifestation of śraddha (firm faith), one of the symptoms of śaraṇāgati (surrender), which in turn is developed in the association of the devotees. Śrīman Mahāprabhu said, “O tattva-vādi āchāryas, the doctrines of your sampradāya are almost against pure devotion. In spite of that the only qualification that could be seen is that you accept the Lord and His Deity Form as Eternal Truth. My parama-gurudeva, Śree Mādhavendra Pūri, had accepted Śree Madhva sampradāya seeing this principal doctrine.” — Śrīla Ṭhākur Bhaktivinode. Śree Madhva’s school of thought is known as dvaita-vād (duality). Other names — svatantra-asvatantra-vād, svābhāvik-bhed-vād, keval-bhed-vād, tattva-vād. ‘Svatantra’ and ‘asvatantra’ indicate that there is an eternal distinction between fully independent Lord and the dependent living entities (jīvas). The five differences among – living entity and Lord, living entity and living entity, Lord and matter, living entity and matter, and matter and matter – is eternal and from time immemorial. Śree Śankara had not accepted duality. According to him nirguṇ brahman (Absolute Spirit without attributes) is the eternal truth and saguna brahma is false. Śree Madhva accepted duality on the basis of the svatantra (independent) and paratantra (dependent) principles. The difference between svatantra Lord and the paratantra entities is real, eternal and beginning-less. According to Śree Śankara — jīva is ignorant and illusioned Brahman. There is no separate existence of jīvas except for their illusioned false consideration due to ignorance. According to Śree Madhva — jīva is among the dependent entities and is conscious, separate, eternally different and a shadow potency of Brahman. Jīvas are real, finite and minute. According to Śree Śankara — world is false and has got no actual pāramārthik (transcendental) power but has only vyāvahārik (pragmatic) power. According to Śree Madhva — world is different from Brahman, real, an intelligent creation by Lord, under the control of Viṣṇu and eternally existing. As per Śree Śankarāchārya — Tattvamasi comprises of ‘tat’ (Brahman) and ‘tvam’ (jīva) that have relation with equal adhikaraṇ (honor), indicating complete oneness of jīva and Brahman. Madhavmuni had not accepted ‘tattvamasi’. According to him – sa ātmātattvamasi = sa atma + atattvamasi – means jīva and Lord are different. He told that in Chāndogya Upaniṣad ‘atattvamasi’ term is repeated nine times to Śvetaketu (son of a muni) along with illustrations indicating the distinction between jīvātma and parmātma. ‘Atattvamasi’ can also be found in Sāmasaṁhita. In Nyāyāmṛta, a detailed commentary on ‘atattvamasi’ is given. Śree Gauḍa Pūrṇānanda, the compiler of Tattva-muktāvali and a disciple of Śree Nārāyaṇa Bhaṭṭa, who in turn is a follower of Śree Madhva’s school of thought, had explained ‘tasya tvamasi’ – means you are of Him (you are servant of Paramātma or you are for Him). — The History and Significance of Gauḍīya Darśan. Madhva, also called Ānandatīrtha or Pūrṇaprajña (B. C. 1199, Kalyānpur, near Uḍipi, Karnatak, India -d.c. 1278 Uḍipi). Hindu philosopher, exponent of Dvaita (qv. dualism or belief in a basic difference in kind between God and individual souls). His followers are called Madhvas. Born into Brāhmin family, his life in many respects parallels the life of Jesus Christ. Miracles attributed to Christ in the New Testament were also attributed to Madhva. Madhva set out to refute the non-dualistic Advaita philosophy of Śankara, who believed the individual self to be a phenomenon and the absolute spirit (Brahman) the only reality.” — Encyclopaedia Britannica, Vol. 7, page 654.